Angel Pie Recipe is a delicious fruit cocktail pie that is light and fluffy producing an attractive peach hue with similar Creamsicle taste. It is so easy and makes an impression on those who taste it. I first made a version of this pie in the 1960s and did not particularly care for it at that time. Recently, I came across an old piece of paper I had written the recipe down on and thought I would try it again, to see if I could make it better. I did... our family liked it... now it's a new family tradition! Place cracker crumbs in a mixing bowl. Add coconut and sugar and toss, mixing thoroughly. Blend in softened butter with a fork or your fingers. Press mixture into the bottom and around sides of a 9" deep dish pie plate or pan. Bake in a preheated oven 350F. for 12-15 minutes. Place in the refrigerator and chill until your filling is ready. Reserve some of the fruit pieces for garnishing, if desired. Pour the orange juice in a 1 cup measuring cup. Add enough of the fruit cocktail juice to make a full cup. Pour into a medium size sauce pan and heat until it boils. Remove from heat. Sprinkle in Jello and stir until it gelatin dissolves, about 2-3 minutes. Stir in other 1/2 cup juice. Add enough water to make the 1/2 cup liquid, if necessary. Cool mixture if it is still warm. Place Jello in the refrigerator until the mixture gels to a little thicker than unbeaten egg whites. (About 40 minutes. Can spread out in an oblong glass baking dish to hasten the gel. Remove from the refrigerator and beat in a mixer on high speed until it is gelatin is light colored and fluffy. 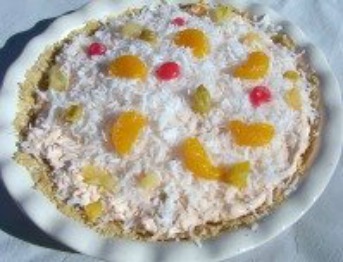 Sprinkle coconut on top and garnish with reserved fruits. Chill in refrigerator several hours or over night. Serve cold. Store leftovers in refrigerator.